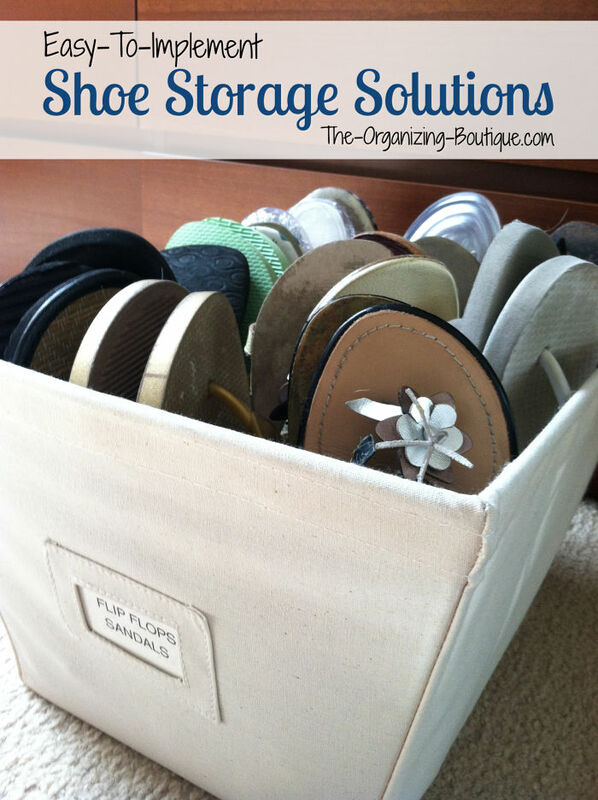 Here are some fantastic shoe storage solutions and decluttering strategies! I love shoes, and I love organizing...I love organizing shoes! 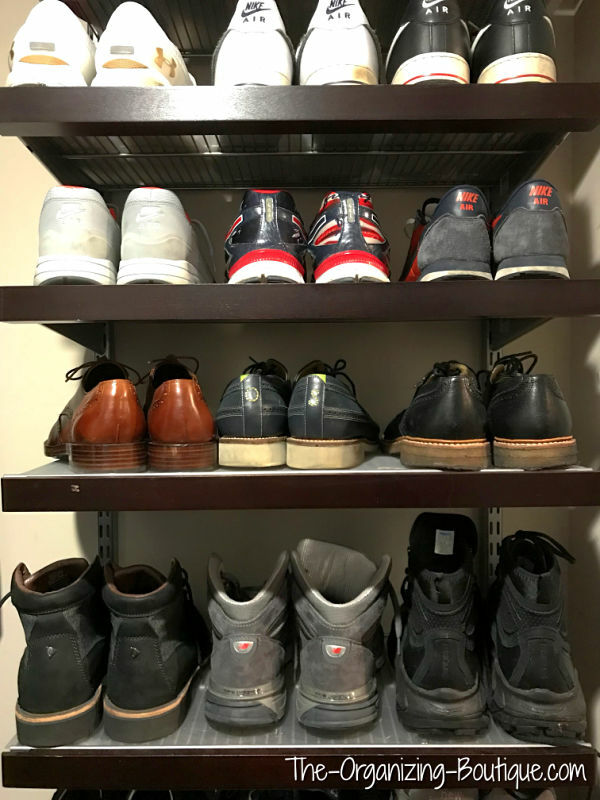 I have found some creative ways to store shoes even in small spaces, and I've shared them below. The following shoe storage solutions will help clear the closet clutter, ensure that you can find what you need when you need it, and keep your footwear in better condition. Enjoy! Utilize the general organizing procedure of purge, sort and store and use it for shoe organization. Pick up ONE pair of shoes at a time and decide if it is worth keeping. In order to accomplish this, ask yourself appropriate questions (Do I still wear these? Are they in good condition? Are they still in style? Do they hurt my feet?). Take out the trash, and put the donations in your car. This hinders the possibility of undoing your hard shoe organizing work. 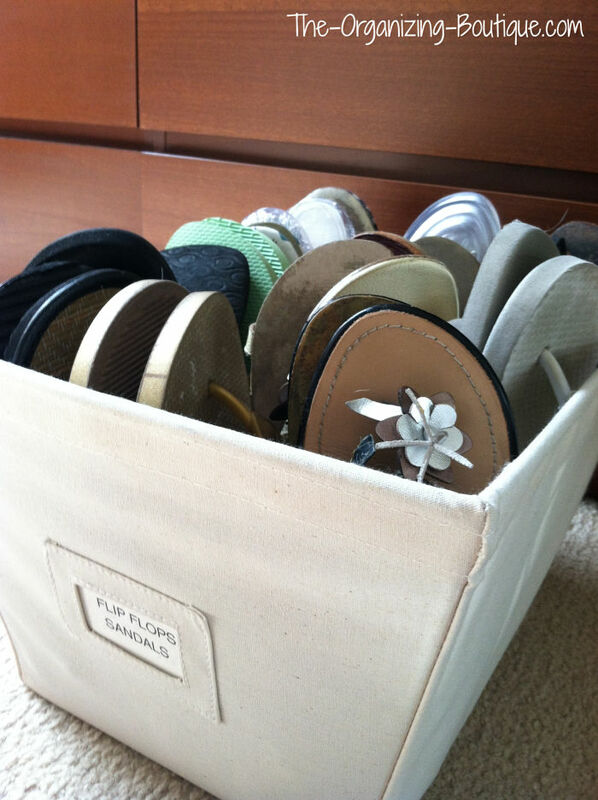 See how easy it is to access shoes stored in a canvas bin?! Now that you have gotten rid of all the unnecessary and unwanted shoes, the focus is on what's left. Divide up what remains into categories and put like with like (i.e. sandals, boots, sneakers). If you have enough room in your clothing closet to hold all of your shoes, then great! These are elfa shelves from The Container Store in my client's closet, and they hold almost all of his shoes. If not, think about utilizing other spaces like underneath your bed or in the entryway (like the Overstock cabinet in the photo below). This cabinet from Overstock is the perfect shoe storage solution for my client's entryway. Another option, if you're short on space, is to put your out-of-season shoes (like winter boots) in another room like the basement, attic or garage. • Get into the habit of putting away your shoes every day and promote this behavior to others in your household. This keeps your home more organized and clean as well as prevents catastrophes like the dog getting a hold of your nice black stilettos. • Another idea that I consider every time I buy a pair of shoes is whether or not I have a pair like it. If I do, I'll think twice about spending the money and allowing more stuff into my life. If I don't, I'll pick out a pair of shoes to give away when I get home, so that my purchase REPLACES instead of ADDS TO what I own. Shoe organizers are a must! Check out these products for maximizing your space. This is a shoe organizing dream! Utilize all of that vertical space in your closet by stacking these shoe storage boxes and storing stuff inside. The drop-front makes it easy to access your items. Revolving Shoe Tree - a Favorite of the Shoe Storage Solutions! In this corner, taking up only 1 square foot of space, is the shoe tree!! This creative item is easy to assemble and eliminates the shoe piles that seem to just appear around the house. Organize and protect your shoes with this sturdy organizer. It holds up to 12 pairs of shoes and fits nicely under the bed or in the bottom of the closet. If you have the space, shoe cubbies are great storage solutions. Some of them double as entryway seating, and others can be stacked. This particular one can be built into whatever shape fits your space. This door shoe organizer holds flip flops and takes up minimal space. Take a look! Looking for a shoe storage bench for your entryway or mudroom? 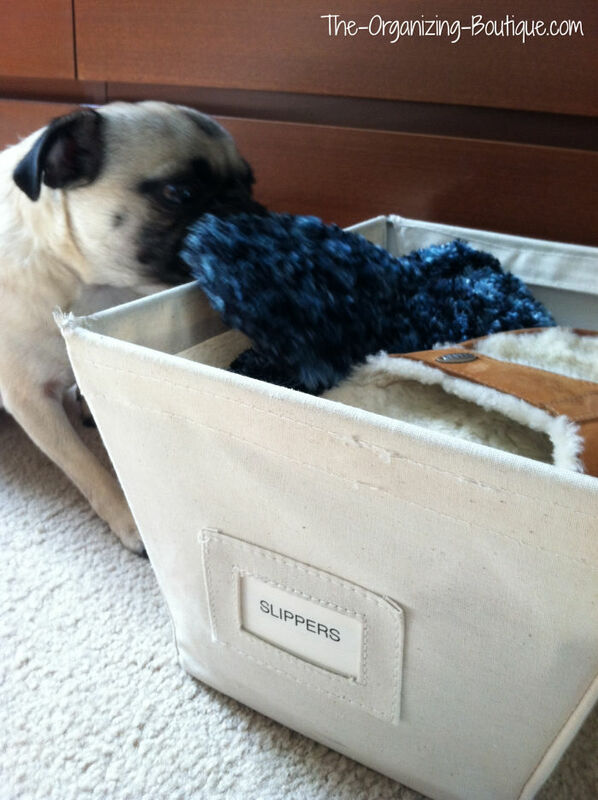 Look at these top-rated shoe organizers! 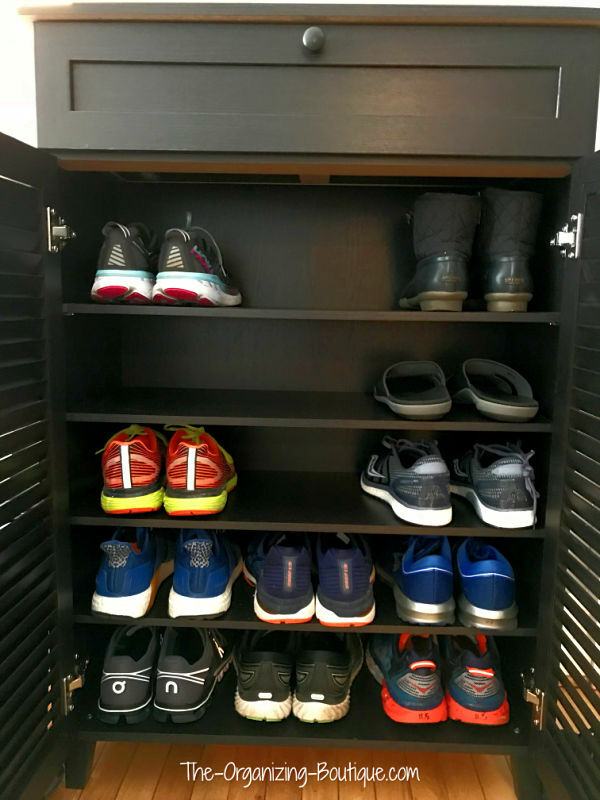 One of my favorite shoe storage solutions is the over door shoe organizer. This product doesn't take up any hanging space or floor space. Check out these top-rated closet shoe organizers!